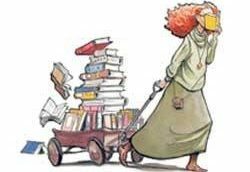 Random Knowledge Syndrome is the inevitable result of life as a librarian. It is the condition of knowing a little bit about a whole lot of things. Context-free passages from Shakespeare? I’ve got them. The names of all of Elizabeth Taylor’s husbands? I’ve got them too. My head contains the names of William the Conqueror’s parents (Pepin the Short and Big Foot Bertha), the dosage at which acetaminophen becomes toxic (7.5 to 10 mg) and how to say “I can’t speak Swedish” in Swedish (Jag kan talla inte Svenska). The blog Random Knowledge Syndrome is me writing about things that are interesting to me. Given my RKS that could literally be anything.